My net worth improved over the past month, due mostly to a large biannual dividend received into our SMSF Vanguard High-growth Fund investment. 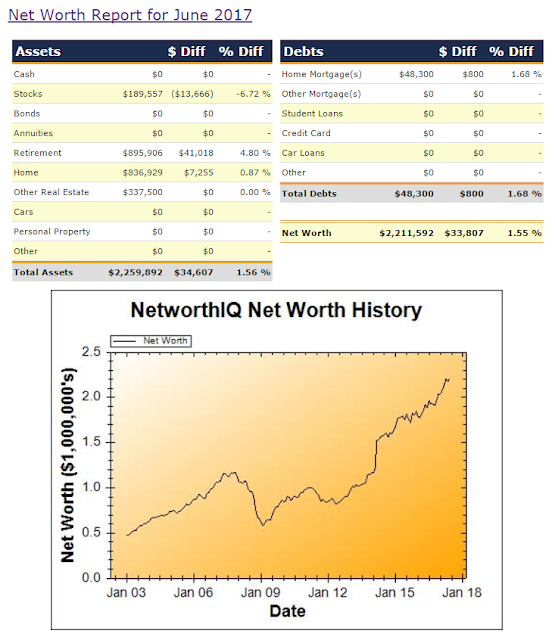 Overall, my retirement savings balance increased by $41,108 (+4.80%), which more than offset a decrease in the value of my geared stock portfolio, which was down $13,666 (-6.72% due to gearing). The decrease in net value of my geared stock portfolio was partly due to some weakness in the stock markets, but also due to making prepayments for the next 12 months of margin loan interest on most of the loan balance (I only kept a smal proportion of these loan balances as 'variable', so I can pay off some of the loan balances if I have spare cashflow). The valuation of our home also increased slightly last month. DW is still unemployed, so she withdrew some of the money she'd deposited into the joint savings account for monthly loan payments next year (which made the mortgage amount increase slightly in my NW calculations).